It is with great pleasure (and relief) that I am finally able to announce the publication of my book! To celebrate, I'm having a book giveaway! The book is based on my blog but has been organized into topics and expanded. 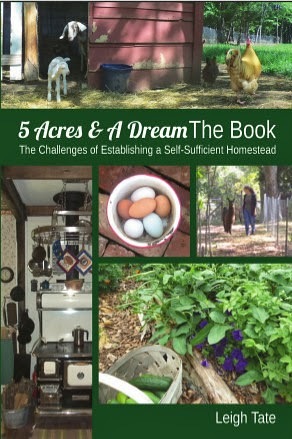 It is neither a "how-to" book, nor a "why-to" book, although in the introduction I included your answers from my blog survey "Question For My Readers: Why Homestead?" Rather, this book is the telling of Dan's and my story, of our experiences in trying to establish a self-sufficient homestead. It's the telling of our dream and how we've begun to fulfill it. I share what we've researched, what we've tried, our successes and failures, and what we've learned from them. That's 262 pages in a 6 inch by 9 inch paperback for $12.95. Why no Kindle (mobi) edition? Kindle lovers will be asking this so here's the answer. Although I don't read books by this method, I looked into it for those who do. What I learned is that e-readers do best with text, less so with images and illustrations. In fact, it's the images that drive up the cost of the Kindle editions. Because my book has 142 photos and 14 drawings/diagrams, I opted not to go this route for now. The story behind this book goes back to Benita, (Basically Benita) who first encouraged me to turn my blog into a book. I honestly didn't take her seriously at first, but she kept prodding gently, until I finally decided to do it. Her support and help have been invaluable. It has been several years in the making, in fact, my first subtitle was going to be "The First Four Years". I thought I'd have it done by then. We're wrapping up five years here, so you can see it took longer than I first anticipated! Part of that has been tackling some steep learning curves. Unless one wants to hire out the various parts of the process, the world of self-publishing falls almost entirely on Self. It includes not only writing and photography, but also formatting, book and cover design, learning the software to make it all happen, as well as learning how to comply with commercial printers' standards. I can't tell you how many times I became discouraged and felt like giving up. But every time that happened, one of you would email me and tell me I ought to write a book! It is to you, my blog readers, that this book has been dedicated. I'd also like to draw your attention to the cover photo of my wood cookstove. Do you see the pot holders hanging on the pot rack above the stove? Those are the potholders I won in a giveaway by our very own Mama Pea! Please do consider entering my book giveaway. It's open to anyone, anywhere in the world. I would love to put a free copy into someone's hands, plus you'd be helping me promote my book. I would be ever so grateful for that. Information on how to enter is now closed. The giveaway ends December 17 at midnight. Until then, I'm going to take a brief break from blogging. I'll be back on December 18th, announcing the winner and ready to blog once more. Congratulations on completing your first book! What an exciting time for you. Wishing you much success! Congrats on your book! I am so happy for you! Oh exciting! What an accomplishment-Congratulations! Congratulations Leigh! How exciting for you. You stayed the course - well done. It took me 4 months to write my solar oven cook book - so I can imagine how much work went into your book! I take my hat off to you! Congratulations! That's a huge undertaking. It's fabulous that you've got something so worthwhile as a result. Way to go! So exciting! You did it. So very proud of you! Count me in. Did you set up a "book bomb" day? Check Urban Dictionary for the explanation if you don't know already. Congratulations Leigh! Thank you to everyone for your good wishes. They mean a lot! Wow - Congrats on the Book!! I love your blog, so the book is sure to be awesome. Crusty, that change of blog address was a bonafide Google fiasco. I'm glad you found me again, though I can't say I've been all that good about doing blog visits on my own! What a neat idea, it looks like a good book. Five years is a lot of blogging! 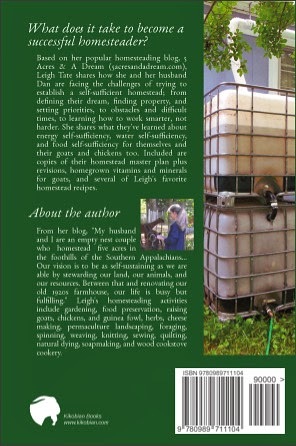 Leigh, I am so excited to learn that you have taken your blog the next step - publishing a book. Hurray! Looking forward to reading it! All right! I ordered a copy yesterday, but Amazon says it won't be here for another 11 days(!) even though I chose 5-8 day shipping. Alas. I'll be sure to post a review at Amazon once I receive it and get a chance to read it. I urge other folks to do the same as getting a pile of good amazon reviews goes a long way toward helping smaller authors. Let me know if you ever want to talk shop or exchange ideas about self-publishing! Whoo hoo! Once I do some clicking and find out how to enter, I'm going to as well as put it on my FB page (not that I have a lot of "friends", but heck, why not?). Congrats on the "Big Time"! Congratulations that is so cool. Know it had to be a lot of work but well worth it. Oh, Congratulations on a job well done!!! I'll be in touch. Shameless plug just made on my blog. Here's hoping your book is a roaring success. I am so look happy and excited for you! 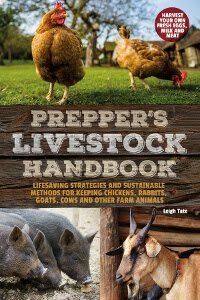 I'm letting all my Homesteading "followers" know they MUST include your BOOK in their library...You and Dan are amazingly awesome! Don't know where the *look* came from! Sorry! I'll leave the writing to you. ;) Just purchased the book using your Amazon link. Congratulations and best wishes. You deserve the greatest success! Once again, I am both humbled and encouraged by everyone's good wishes and willingness to help me spread the word. Garrett, I'm delighted to know other self-published authors like yourself! I can tell you I've already learned a lot from reading your blog about your own journey. It helped a lot! Carolyn, yes! The entire job of promoting a self-published book falls entirely on the shoulders of the author, so every little bit helps! Thank you! Sharon, thank you! I did start an author blog, Building A Book, with the intent of chronicling my self-publishing journey, but it always took a back seat so it's pretty sporadic. That said, I'll tell you anything you want to know, especially if it encourages you to get back to work on your own book. I think it would do very well! Oh my gosh!!!! How exciting :) I had no idea you were working on this! What a fabulous idea and I am sure it will be a huge hit!!! Oh my gosh CONGRATULATIONS Leigh, this is beyond awesome. Super excited for you! Stephanie thank you! And thank you for entering the giveaway! Big congratulations on this . It sounds very well put together. I can't wait to read a copy ! Congrats to you!! What an accomplishment! Hi Leigh! I'm so proud of you! You are amazing!!! I know your book will be AMAZING if it's anything like your blog! Can't wait to read it! great success for you...looking forward to having a copy and sharing with friends and family!! I do hope it will be carried here in Canada ! I shop at Chapters online but can also do amazon.ca too . Wonderful! I'm putting it on my wishlist right away. Lucia, a fellow author! Welcome and thank you! Off-Grid Homestead, Amber, and Kyle, thank you! Rox, excellent question! I went to the author's community on amazon and apparently a lot of folks are asking the same question. To get it listed in Canada (and other nonEuropean sites) I had to enable "Expanded Distribution". I did this but it may take from 6 to 8 weeks before the listing shows up. One way to query any book for where it's located online, is with GetTextbooks.com. Just type in ISBN, author, or title to get a listing. It's how I've been keeping track. And thank you for helping me spread the word! Leigh, I am so proud of you, as I know you put so much of yourself, time and energy into your book. As you know, I am on Facebook, so if you don't mind...I'm going to share this link there...as I have lot's of goatie and farm peeps on there. Congrats again! :) Hugs! I know I'm slow (I blame it all on too much snow to shovel and move!) but I just put a much deserved shout-out heralding your book on my blog. Seems like you've already got many folks interested in it and I wish you a boat load of sales by Christmas time. You deserve to have your practical information and expertise acknowledged and spread around. I'm sure eager to get a copy for our library! YAY! How fabulous is that. Congratulations, Leigh! I am so impressed!!! When ever did you get the time to write a book? Not like you haven't been busy that's for sure. I'm sorry I didn't comment earlier, I was out of state with family. Well done on writting your book! Sounds right up my street! You all have made my day with your good wishes and kind encouragements. Thank you so much. I appreciate every blog link, tweet, FB and G+ mention more than you know. And thank you to every one who has bought a copy! I hope it is an encouragement and resource for you. Thank you too for reviews on Amazon. I'm told they really help. OMG! OMG! OMG! Leigh!!!! How freaking cool is this?!?!?!?!? I know a famous author!!!!!!! EEEEEEK!!!!! Hey! How cool and appropriate is this! I'll be ordering the book next chance I get. It would be even more fun to have it autographed!! Crystal, you are so cute! Actually, I think you should write a book about goats! I don't know of anyone more knowledgeable. Congratulations! The book looks great! I'm a chapter in and there is so much I love/understand/am experiencing on our adventure! I have a feeling that we are going to learn a TON and get a lot of great ideas from your hard work! Congratulations and thanks for sharing both on your blog as well as in the book! Time to dive back into it! Homestead Mania, thanks! I tried to make a return blog visit but didn't find a link from your G+ page. Shawn, you just made my day! That was my goal in writing it, to connect with and encourage others who are working toward the same thing. I'd like to get a "What readers are saying" page up, and would love use your comment (along with a link to your blog). Leigh...Your book came today...talk about speedy shipping...it's wonderful! I keep flipping through the pages and stroking the cover: I just love everything about it. I hope you sell millions of copies! Lynda, thank you so much for that! You just made my day. Maura, thank you! The willingness of everyone to spread the word is truly a blessing. Wonderful! Congrats on all the hard work. I'm looking forward to reading it and having it as a resource! I swear I left a comment yesterday! (witch way did it go?) I also wrote a post abut your book and even went to "Face Book" and wrote about it. I let all my family and friends know. Pleas give me the 4 entries...PLEASE!! I have read your blog for many years. Just got your book and I love recalling your progress. I feel somehow that I have walked with you. Your book is fantastic. Such fun reading. Thanks for all your hard work. Bill, thank you! 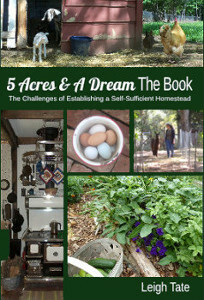 I sincerely hope it is both a resource and encouragement to others who are interested in the homesteading lifestyle. got the book today - brilliant! I read bits and pieces, but have to find the time to do it from start to end:) thanks for the nice christmas read! Woah, what a great accomplishment - both the homesteading, the recording of it, and then the publishing! Congratulations, Leigh! Bettina, thank you! It's so amazing that folks from all over the world can read it. That's humbling. Kaat, thank you! I knew you'd be able to appreciate it! Leigh, congratulations on your great accomplishment! I'll do a blog post this week (3rd in Dec) and let folks know about your book. How exciting! I've been out of the blog world for a bit and just returned to find your book! Bought it....on Amazon....and it will arrive for Christmas! Can't wait to stroll through it! Badgerpendous, thank you! I'm honored! Julene, so good to hear from you! Glad to hear you're back to blogging too. And thank you so much for buying a copy! I sincerely hope you enjoy it. Leigh, I am ashamed that I have waited this long to blog about your book. Honestly! I had NO idea, nor memory, I had promised this in DECEMBER! AAARRRGGGHHH! Yes, times does fly and yes, I am the pilot and am still using the same sad excuse of Dave's death for being so far behind. His unexpected death has thrown me into a 2.5 plus year tizzy from which I am only now beginning to emerge. Regardless, I tried to pull a copy of your book from your site but wasn't allowed. I understand why and blogged without the picture but did give a link. Best wishes and congratulations on more than 1,100 books sold!